The Pyramids of Giza are one of the ancient Seven Wonders of the World. Housing burial chambers of Pharaohs, the complexity and technical excellence of pyramids have fascinated archaeologists and historians. 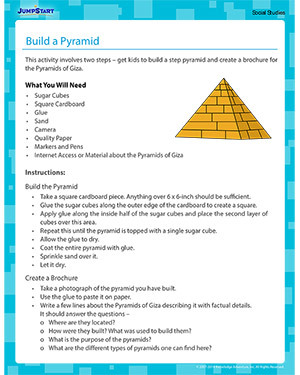 In this activity, children can build a sugar cube pyramid and create a brochure. You can also check out other free printable social studies activities for kids.